Discontinuous fiber composites (DFC) are produced by compression molding of prepreg chips which are made of a combination of unidirectional fiber and a Thermoset or ThermoPlastic matrix. In some cases, matrix is made of thermoset which consolidate through a chemical/ cure reaction at elevated temperature. However, when the curing cycle is not well monitored it can be observed some cracks that appear between the chips due to apparition of thermal stresses normal to two chips. 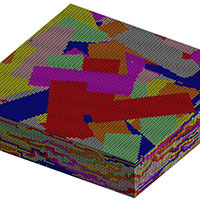 Due to their complex microstructure, these materials request the definition of new dedicated methods in order to capture accurately the local orientation and to compute the local homogenized properties in order to simulate correctly the curing and the design process. Hence, the Digimat platform is used to build a complete methodology to compute these residual stresses and to take them into account during the design cycle of the part. Propose a complete methodology to analyze Discontinuous Fiber Composites: Understand the effect of the local microstructure on the behavior of the part. Improve the understanding of the effects of the manufacturing cycle parameters: Evaluate the risk fo the apparition of defects between the chips for a given set of parameters of manufacturing (pressure, temperature histories). Though their nature is different, this procedure can be applied for both, thermoset or thermoplastic resin.